In a society where characterizations of gender and identity are fluid, how should we define manhood? This encouraging guide will help you get it right! Drawing on his experiences as a policeman and CEO, Promise Keepers leader Harrison offers bold biblical teaching on true masculinity to help you become a better husband, father, co-worker, friend, and Christian. 224 pages, hardcover from Multnomah. KEN HARRISON serves as the Chief Executive Officer of WaterStone, an organization that releases resources to support Christian humanitarian efforts worldwide. Currently WaterStone oversees donations of millions of dollars per month and manages a fund of $400+ million. He started his career as a Los Angeles police officer in the infamous 77th Division of South-Central Los Angeles, better known as Watts or Compton. There he received numerous commendations and awards. After leaving the LAPD in the 1990s, Ken went into business and built a small local company into one of the largest of its kind in the United States. He has served on multiple boards, and recently stepped into the role of chairman of the board of Promise Keepers, a well-known organization ministering to Christian men. Harrison is also the author of Victims & Victors. He has been married to his wife, Elliette, for 27 years and they have three children. "I have passed the Promise Keepers baton to Ken Harrison with exceeding joy because Ken is a man of the Word and a man of prayer. Never has there been a greater need for men of the Word and prayer because men lead based on who they are. Additionally, Ken has a genuine love for brothers of color and is committed to ensure they are reached, included, and fully involved as Promise Keepers builds an army of godly men. Read this book; it was written by a man of integrity." "No one will ever accuse Ken Harrison, a gritty ex-policeman who now heads Promise Keepers, of pulling any punches in describing the role of a servant king. His message is clear, direct, and on target as he challenges men to accept their responsibility as Christ followers in all arenas of life. Men of all ages will be encouraged by this timely reminder of both the cost and opportunity of authentic manhood." 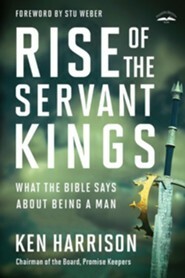 "In Rise of the Servant Kings, Ken Harrison explains clearly what the core qualities of a man of God should be. Since Ken is an expolice officer, he is not afraid to get right to the nitty-gritty in describing how a man can apply the Bibles principles for authentic masculinity in every area of lifefrom personal integrity to marriage to fatherhood to serving his fellow man. If you want a no-nonsense guide to getting manhood right, this is it." "Some authors write with ink and some with water. Harrison writes with blood and fire, and his soul-stirring call for men to rise to the challenge of the hour is bold, timely, and heartwarming. If Christian men respond as the promise keepers described here, the world will be a different and better place." "Because Im a woman, I dont usually read books about being a man, but my husband was reading Kens book and was so enthusiastic that I wanted to know what set this book apart. Kens stories captivated me. His honesty inspired me. The book pulses with masculinity, yet God spoke to me, a woman! 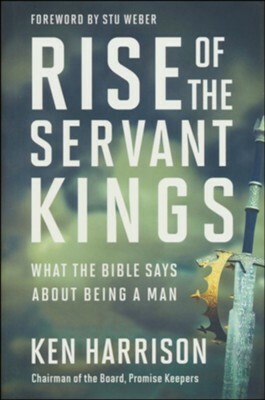 Im buying Rise of the Servant Kings for every man in my life!" "Masculinity, as God designed it, isnt toxic. Rather, its good, life giving, courageous, and sacrificial. There were times while reading this book when I felt as if Ken were in my face! It was uncomfortable, but what he says is spot-on. I know Ken loves Christ, cares about the right things, and is passionate about seeing Gods kingdom advance. The truth he speaks is truth men need to hear." "Ken has captured the biblical mandate of manhood. In a world of putting self first, he encourages men to be servant leaders both to their fellow man and to their God." "Scripture teaches and history affirms that our greatest kings and leaders have strong and loving hearts that beat to serve God, their families, and humanity. Ken writes and leads by example." "You may have heard the statement that being male is a matter of birth, but being a man is a matter of choice. Ken Harrison challenges us to the next level, that being a man of God means choosing to live proactively, courageously, and humbly. Masterfully blending deep theological insight with fascinating experiences as part of the LAPD, Ken addresses with sledgehammer force the key issues men struggle with. This book will arrest your heart to choose living out your true design as a servant king!" "Ken Harrison is the kind of person he writes about. Hes a man of character and conviction, and much of his book calls us to a similar path. 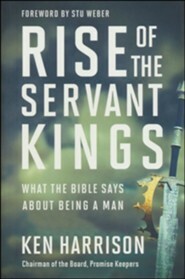 Im thankful that Rise of the Servant Kings will encourage men to be who God has called them to be." "There are many voices speaking to us of manhood today. Ken Harrisons is unique among them. It sounds forth from his gritty years as an LA cop, his inspiring business experience, and his hard-won victories as a leader of men. He is streetwise and biblical, humorous and learned. He issues a call to righteous manhood that we need to hear." "Little boys dont want to grow up to be polite citizens who keep their lawn manicured. They want to be heroes and even superheroes who right wrongs, deliver the oppressed, and save the world. In Rise of the Servant Kings, Ken has done grown-up boys a favor by providing them both a reminder and a road map to experience the true greatness their Father King has planned for them." I'm the author/artist and I want to review Rise of the Servant Kings: What the Bible Says About a Man.